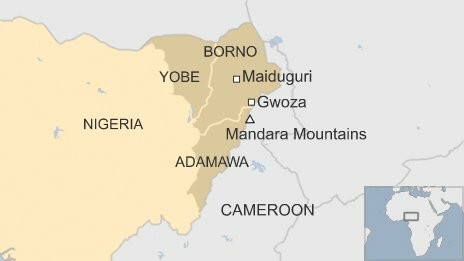 At least 21 people have been killed in a bomb blast in northern Nigeria as they were watching a World Cup match, a hospital source has told the BBC. Witnesses in Damaturu, in Yobe state, say a suicide bomber in a tricycle taxi detonated explosives as people watched Brazil’s match against Mexico on TV. At least 27 people are said to have been seriously injured. 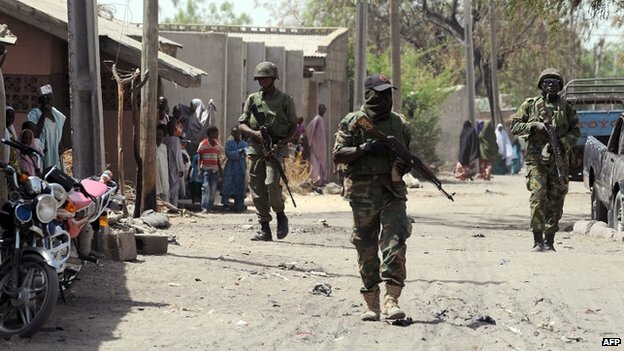 Three states, including Yobe, are under a government-imposed state of emergency following years of attacks. No group has said it was behind the latest blast. The local police chief has told the BBC that the attack happened outside a shop with a television, where people had gathered to watch the game. He said it was not a viewing centre where Nigerians often watch football matches, as these have been banned in the state. Other sources say it was a viewing centre which was attacked. While the police say 13 people died, the hospital worker told the BBC he had personally counted 21 bodies. Correspondents say Nigeria’s authorities often downplay the number of casualties. In another development, the authorities say a senior Boko Haram militant was among almost 500 northerners arrested as they travelled to Nigeria’s oil hub of Port Harcourt earlier this week. The authorities did not name the suspect. Relatives of those arrested say they had no links to Boko Haram and had gone to southern Nigeria for economic reasons. The Damaturu hospital worker said truckloads of injured people were being treated in overcrowded wards after the explosion on Tuesday evening. “The military and police trucks that brought them in have made four return trips so far ferrying them in,” the worker said. The worker said that the injuries suffered by people caught up in the blast were “horrific”. Damaturu resident Mohammed Kurkure Yobe told the BBC that the venue where the attack took place was very popular and often crowded with people watching big events. 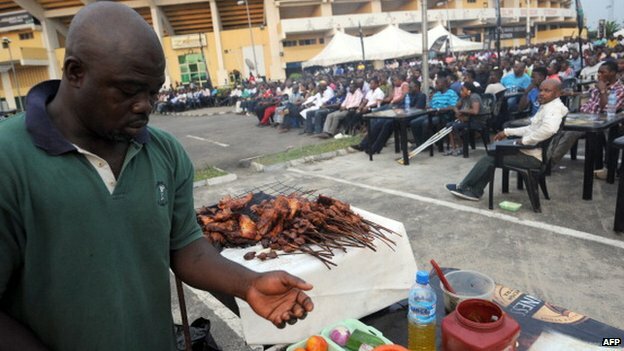 Open-air viewing centres – where people pay to watch live football – are popular throughout Nigeria. Boko Haram has described football as un-Islamic. On 1 June at least 14 people were killed in a bomb attack on a bar in Adamawa that was screening a televised football match. No group claimed responsibility for the blast. In March, many people were also killed in explosions while watching football in a video hall in Borno’s Maiduguri town. On both occasions, Boko Haram was blamed for the blasts. Boko Haram – which means “Western education is forbidden” in the Hausa language – wants to overthrow the government and create an Islamic state. The group captured international attention in April after it abducted more than 200 girls in Chibok in Borno state. The states of Borno, Yobe and Adamawa have been under a state of emergency since May 2013. 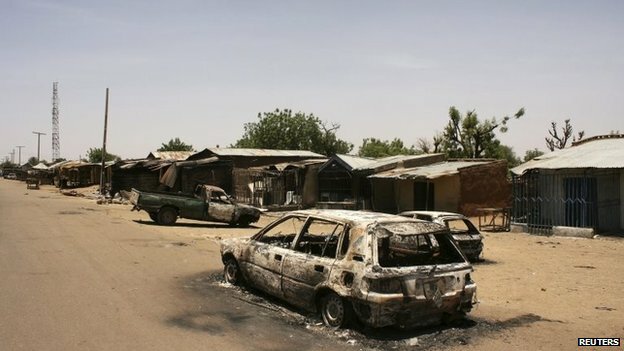 Thousands have died in the north-east since Boko Haram launched an insurgency in 2009. Posted on 18th June 2014 by newsafrica. This entry was posted in #BringBackOurGirls, African Security, al Qaeda in Africa, Al Shabab, Boko Haram, Human Rights Violations, Nigeria, President Jonathan, Women's Rights and tagged BBC, Boko Haram, Borno State, Chibok, Damaturu, Nigeria, World Cup, Yobe State. Bookmark the permalink.